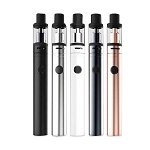 SMOK has impressed serious vapers around the world for years with their range of high-quality vaporizers and vaping products. SMOK hasnï¾’t failed to disappoint with its latest vaporizer, the SMOK Priv One! The Priv One by SMOK may not be its most powerful vaporizer ever released, but for vapers searching for a compact vaporizer, it could the perfect solution. The SMOK Priv One will allow vapers to pump out some serious clouds without having to carry around a large vaporizer. Youï¾’ll be impressed with the Priv One all in one tank and Mod package. The Priv One features a large 920 mAh internal battery. It doesnï¾’t matter if youï¾’re a serious chain vaper or just like a quiet vape during the day, the Priv One will see you through. You wouldnï¾’t think that such a small vaporizer would pack such a big punch, but the Priv One offers vapers serious vapor production combined with delicious and intense flavors. The Priv One has a top airflow system which allows you to vape some deep hits from this mighty little vaporizer. Itï¾’s hard to describe the Priv One and do its beautiful appearance justice. The Priv One is made from high-quality materials and finished off with a mother of pearl inlay that looks amazing. The Priv One uses SMOK Stick AIO coils that utilize a bottom wicking setup. Youï¾’ll love the affordable price of the Priv One and how long the Stick AIO coils last. Rated at 0.6 Ohms and gives you the option of either a restricted or airy draw.